Brightman’s Best Weed and Grass Killer | High Ground, Inc.
Brightman’s Best Weed and Grass Killer uses food grade ingredients to kill unwanted plants and grasses, and is listed as EPA-exempt. 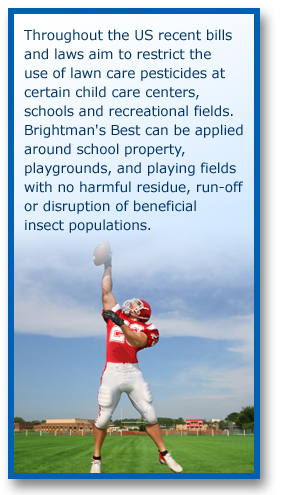 Brightman’s Best Weed and Grass Killer is safe for people, pets, the planet, and waterways, when used as directed. 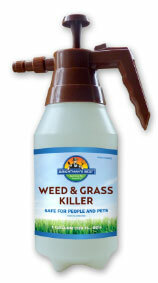 Weed and Grass Killer is based on a natural, fast-acting formula. it’s a highly effective organic alternative to synthetic herbicides. Our tagline is “Best from the Ground Up” because our patent-pending formula is highly biodegradable and works systemically for total kill of annual and perennial broadleaves and grasses. When Brightman’s Best is sprayed on unwanted plants and grasses, people and pets can immediately reenter the area as soon as the product has dried on the plant matter, without concern for skin contact, inhalation, paw licking or other reactions. For more information please visit the Brightman’s Best website at www.brightmansbest.com.